EFT is simply the BEST for Self Help - EVER! 85% of ALL people who use EFT find it helps - a lot. Simply Drain Away - and how useful is that?! You can go full steam ahead and get "in the zone" anytime you want! Hands Up Who Got Some Relief Here! "As part of our workshop we decided to teach the participants EFT for relief from physical pain. I invited anyone with any discomfort or pain in their body to come up and join me for a demo... and up came about 20 people!! Did they get relief? You bet they did!" But don't take our word for it - tens of thousands of people all around the world are re-writing their own life scripts of "That's the best it can get" into a true success story with the power of EFT! Here's what experienced professionals who help people with real hard phobias, mental problems, deep depressions and terrible addictions and use EFT every single day say about THEIR experiences with EFT - and they are DELIGHTED to put their real names to this! I have had tremendous therapeutic success with the most serious of pathologies. Clients have reported immediate relief from depression, suicidal thoughts, night terrors & insomnias, childhood abuse traumas, grief and gambling addictions. EFT is a new energy medicine that very quickly impacts change. You may be fearful of trying something so new that claims to work so quickly. As a born skeptic, I totally understand; but I know EFT can work for you. EFT has transformed this counselor's life. EFT put joy back in my work because I was able to witness people achieving their goals in minutes or hours instead of weeks or months. I have used EFT to help people overcome traumas, abuse, phobias, depression, anxiety, chronic anger, grief, chronic pain, allergies to cats and dogs, substance sensitivies, and more. EFT has also helped in weightloss, stopping smoking, and other compulsions and obsessions. Your problems - fears, anxieties, phobias, traumas, etc., are horrendous burdens to live with. I know, because I have had quite a few myself and I have gotten past many of these problems using EFT. These simple techniques have allowed me to get on with my life, and although they are not appropriate for every pain or issue, they can certainly address a great percentage of them - and in a very short time. In addition to problem emotions, addictions, past traumas, etc. EFT is well suited to enhance sports performance, reduce public speaking anxiety and general nervousness prior to any event. When one is confused and or hurting, they want relief. If they spend time and energy looking for help, they want it now! EFT is an advanced technology that can provide that relief. And we can do it now. EFT is so effective that I offer "Results based therapy". This means that you will "feel" a positive difference in one session, or you owe nothing. I love what I do because it works... now! "I haven't felt this good in years!" This is what clients say about their sessions. EFT is a rapid, long lasting, and pain-free technique to deal with emotional or physical trauma. I specialize in using EFT for Peak Performance so you can be the best and do your best in your endeavor. I offer EFT as a cutting edge tool that will help add to your current performance program. GOLFERS: lower your scores, increase focus, release mental blocks, and reduce anxiety with EFT. Even if you just play for fun, EFT can make a difference in your game. ATHLETES: get out of slumps, eliminate doubt and fear, heal injuries rapidly, enhance your confidence, and take your game to the next level with EFT. EFT will aid you in achieving Peak Performance consistently. PERFORMING ARTISTS: reduce anxiety, increase focus, take your performance to the next level and improve self-confidence with EFT. SALES PEOPLE: increase sales, eliminate fears, increase your motivation, and break through your sales comfort zone with EFT. When I started doing EFT, I was amazed at the results. Since then, I have used it on all my clients and myself with spectacular results. Because of the results that EFT has brought, a money back guarantee is now available. Long lasting - once the bad feelings have gone, they stay gone! Applicable everywhere - you won't believe how often EFT can come to your aid! EFT makes YOU feel better - and that impacts EVERYTHING and that is why it is useful with all those many different problems like phobias, relationships, addictions, performance, weightloss, anxiety and, and and! All those problems are there because of negative emotions - and that's what EFT takes away, quickly, simply, reliably, time and time again. And the best thing about it ...? EFT Is So Simple That A Little Child Can Learn It! You don't have to be "a psychologist with 35 years experience" to make EFT work - that's the best thing about it! EFT works GREAT and you really FEEL the difference - right away! Totally Personalized - JUST FOR YOU! How can one technique get to work on all those different kinds of problems so quickly? EFT gets directed to the right places BY WHAT YOU SAY - you direct it with your words to YOUR very own problems and so you get YOUR own problems solved - whatever they may be! So, half of the healing comes from the technique and the other half comes from you - YOU change what YOU decide you want to change! There's no-one telling you what to do, or what you should be like, or what you should want, and better still, NO-ONE NEED EVER KNOW what you're working on! The Secret Weapon Your Friends Don't Need To Know About! You might wonder why you haven't heard much, much more about EFT before. Well, it could be possible that there is someone amongst your friends who has all of a sudden given up smoking, lost weight, found the courage "from somewhere" to ask that person out they've been looking at for so long, changed their job, started living a healthier, more active life - and you wonder HOW DID THEY DO THAT. There are lots of things we don't like other people to know about. Our real problems and deepest fears are not something we like to blurt out even to our best friends, never mind some stranger - unless we're totally desperate! "Adventures In EFT", THE BEST BOOK ON EFT ever written, costs just $24.95. - reliably when you need it the most! Not just that - it GETS BETTER WITH PRACTICE! "When do you need help? Well not in the bright light of day, normally! I used to sit by myself at night, couldn't sleep for worrying, in a terrible state, no-one to call, no-one to talk to - NO MORE! Now, I have EFT. I can help myself - I do the EFT treatment and I can feel all the fear, all the worry, the tension just draining away and I fall asleep with a smile on my face! I can't begin to tell you what that has done for my days, for my life!" "Tell me what other technique there is that you can use right in the middle of a board meeting to get rid of that churning in your stomach - just like a light switch had been turned off! Yes, I used it and then I got up, cool as cucumber, and gave my presentation. It was INCREDIBLE." "Airplane phobia? Travel sickness? Stress migraines? No more!!!!! I have my 'little therapist' with me all the time, wherever I go - my own hand! Have you any idea what that has meant to me? Not to be afraid of being afraid anymore? God Bless EFT!!!!" Yes, EFT is exactly that - something you can use all the time, anywhere, FOR EVERYTHING and if you want, on everyone! Lots of people learn EFT from a professional psychotherapist for a big problem of their own, but once you have really learned EFT, you OWN IT FOR LIFE and you can share it with others too - if you want to! Just take a moment and read these reports from AVERAGE, EVERY DAY PEOPLE - what EFT did for THEM and what IT MEANT TO THEM. Can YOU think of ways to use this?! "My granddaughter is learning disabled and gets herself into the most terrible states, temper tantrums. She just gets into these screaming fits. She can't read or write but I showed her EFT and practiced with her, we made a song about it to the tune of "A, B, C, D, E, F, G, ..." I can see her on the special bus in the morning, sometimes tapping and singing. It has been truly miraculous how it has calmed her, given her something to do to help herself. I think that is the first time she has ever felt in control. To me, that makes EFT priceless." "My husband has had three heart attacks in the last two years. We both knew that another one could be the last and we were both terrified. He didn't show it of course but I knew he was. I couldn't sleep anymore and in the end had to see a counsellor and she taught me EFT. It helped me so much, I begged him to try it - for both of us. He is very skeptical and doesn't believe in any "new fangled nonsense" but he did it for me. And it worked for him too. He was so surprised! He does it every morning and every night now, just like a fitness routine and I am convinced that EFT helped me save my husband. I can only say to anyone at all, anyone who is listening - please, please try it. It can make so much difference to your life, you won't believe it!" "My child came home from school crying because she had been brutally teased about her looks. I sat with her and tapped with her and less than 10 minutes later, she was transformed - sparkling, bright and confident. What a gift to any parent! To have the power to really help your own children - thank you, thank you, THANK YOU EFT!" Adventures In EFT Is For YOU! For just $24.95, you can get the best instruction IN THE WORLD on how to do EFT like a master - from Dr Silvia Hartmann, the Trainings Director of The Association For Meridian & Energy Therapies, one of the most acclaimed and experienced researchers and lecturers in the world today who modelled Gary Craig himself, the genius who gave EFT to the world. Dr Hartmann has taught EFT to many thousands around the world in her friendly, easy going, down to earth style that speaks directly to you, with no pig-latin or important sounding words, but just honest, straight to the point, brass tacks instructions and examples so that YOU can get the most out of The Best Self Help Technique - EVER! "Adventures In EFT" has been translated into five languages and is acclaimed around the world as The Best Book On EFT. The A-Z Of EFT - For YOU! Dr Hartmann has been collecting examples of exactly what works, techniques and case stories for five years, and it is all arranged in a handy A-Z of EFT for you - you can read it all, or you can look up EXACTLY WHAT YOU NEED and read just that so YOU GET WHAT YOU NEED, RIGHT NOW, and get your changes FAST! You'll keep Adventures In EFT as your reference guide for years to come! Yes, that sounds exactly what I've been waiting for! I want to buy the E-Book NOW! Then just go ahead and FEEL BETTER- Instantly! Allow yourself to be excited! Allow yourself to start thinking about what YOU can do with just a little bit less stress, just a little bit more confidence, just a little bit more sparkling happiness in YOUR life! We have testimonials and thank you letters wall to wall - literally! EFT really is THAT GOOD, and Adventures In EFT IS THE BEST BOOK on EFT in the World! Tens of thousands of delighted, truly delighted people who have found EFT to be so helpful they cannot believe it have written and put their names to their amazing stories. I have been around the houses for 25 years, as a full time scientific researcher, looking for something that would really help people make safe, fast and beneficial changes in their lives. I've done it all - hypnotherapy, NLP, Reiki, psychotherapy, bodywork - I'm qualified to teach things you probably haven't even heard of! But EFT beats all of that. EFT is the best change technique I have EVER encountered. Not only is it amazingly effective, EFT is reliable - it works time and time and time again. I have treated people in consultations, in trainings, in public demonstrations, at health shows, at parties, at international conferences, on the radio and on TV, in the street - and EFT keeps on working, no matter what. It is completely impressive and I salute EFTs designer, Gary Craig, most profoundly for having given us this fantastic tool to help ourselves. EFT has helped countless clients and readers, their families, their friends, their clients and their patients. It has helped my children and my friends too. In my opinion, every human should at least know how to do it - freedom from fear and doubt is in my opinion the greatest gift for a life of freedom, of success, of happiness and true joy in relationships you could ever give yourself. Give EFT a real sporting chance to SHOW YOU what YOU can really do when you are free from fears and limiting ideas - and allow yourself to be truly amazed! That's why I wrote "Adventures" and made sure it was easy to use for everyone at all who, like myself, wants a REAL tool for change and healing, something that really works, quickly. This is the 6th edition of this book, and it has been developed with feedback from previous readers as well as being expanded and enlarged, time and time again, when I found out something new and valuable to add to the A-Z. "Adventures In EFT" is now a great self help "cook book" - you have the basic recipe, lots and lots of special ones for all occasions and at the end of the day, you can create your own recipes for YOUR OWN LIFE. 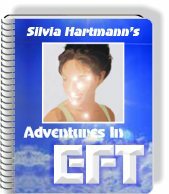 EFT is the best self help technique I've ever seen and I have done my very best to make its excitement and wonderful possibilities come to life for you in "Adventures In EFT". Author, "Adventures In EFT", "The Advanced Patterns Of EFT"
Learn EFT From The Masters! Heal Your Memories - Heal Your Past! Click HERE And Give Yourself The Gift Of A Lifetime! 145 pages, Training Manual size. Instant Download - User Friendly Adobe PDF File - Start NOW with EFT. Includes FREE Lifetime Replacements - FREE Upgrades For Life! Order The E-Book For INSTANT DOWNLOAD NOW! ... and get started on YOUR new life of Emotional Freedom right NOW! Immediate Download - Click To Order NOW.